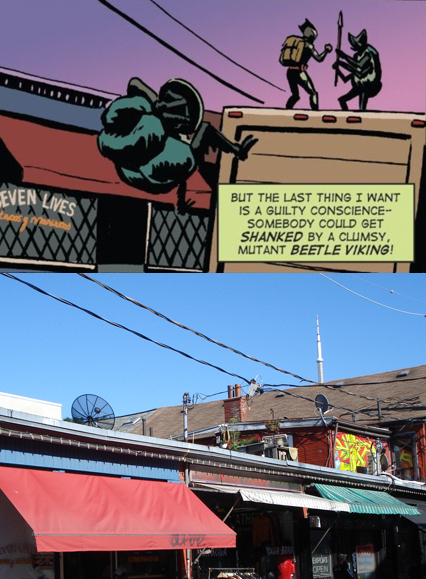 Sticky Footprints: Sticky Step Twenty-Nine: Seven Lives Tacos - 69 Kensington Ave.
Sticky Step Twenty-Nine: Seven Lives Tacos - 69 Kensington Ave.
After knocking off balance one of the remaining Viking Beetles he's been fighting on the back of a delivery truck while passing several Spadina Avenue shopfronts, the Human-Lizard follows up with a well-placed karate kick to send one of the nefarious Norse nightmares flying off the speeding truck to the street below. Although it's never clear whether this particular mutant marauder made the final journey to insect Valhalla, it is fortunate enough to fall off the truck directly in front of Seven Lives Tacos y Mariscos. The Human-Lizard evens the odds outside Seven Lives Tacos. Seven Lives Tacos y Mariscos has been serving up Baja California-style fish tacos (like the house specialty, the Gobernador, served with smoked tuna and shrimp), first as a pop-up restaurant (as part of the Toronto Underground Market, a social food market which ran from 2011 to 2014 to promote local cooks, chefs and food entrepreneurs), before eventually settling into a permanent space at 69 Kensington Avenue in the heart of Kensington Market. A word to the wise, along with an appetite, bring cash and comfortable shoes to wear while standing, because there is almost always a lengthy lineup for these tasty tacos. Seven Lives Tacos y Mariscos at 69 Kensington Avenue. Next up: The Human-Lizard wraps up his vicious Viking Beetle battle in a dark alley next to Dr. Comics.